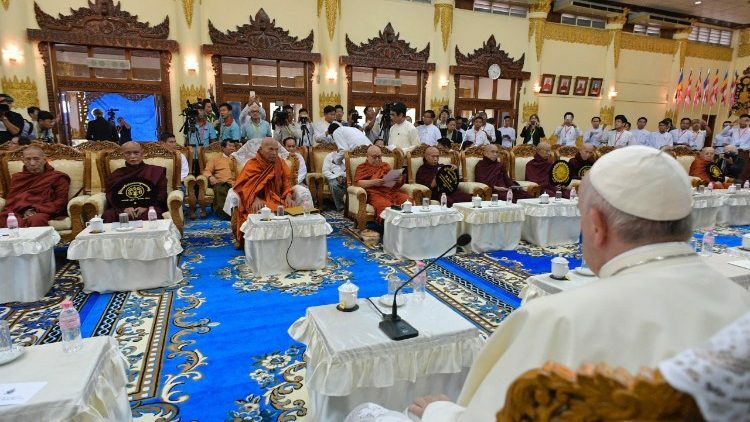 Catholic News World : Pope Francis meets Buddhists, Hindus, Jains, Sikhs - "It is a cause for thanksgiving to God when religious leaders actively foster a culture of encounter"
Pope Francis meets Buddhists, Hindus, Jains, Sikhs - "It is a cause for thanksgiving to God when religious leaders actively foster a culture of encounter"
Buddhist, Hindu, Jain, Sikh and Christian representatives had participated in a conference on Tuesday organized by the Pontifical Council for Interreligious Dialogue. Pope Francis on Wednesday briefly met a delegation of Buddhists, Hindus, Jains and Sikhs who participated in a one-day conference in the Vatican, and another group of Buddhist monks from Thailand. In this regard, Pope Francis recalled the meeting in the Vatican between Blessed Pope Paul VIand the Venerable Somdej Phra Wanaratana, whose portrait can be seen at the office of the Pontifical Council.